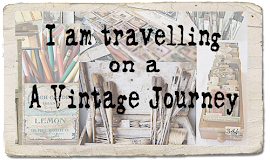 A Vintage Journey: Stencil It! Hi Everyone and Welcome . There are so many fantastic stencils available to us right now and so many ways in which to use them we would like you to include some stenciling in whatever it is you choose to create for this challenge. 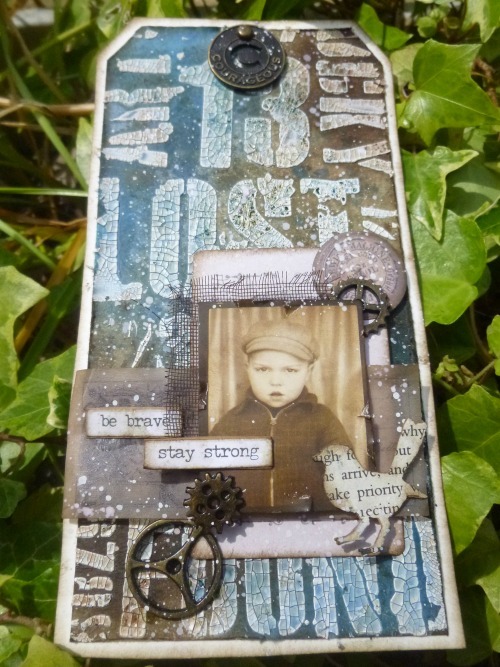 Don't forget inks, sprays, paints, texture/embossing pastes and gesso are all stencil friendly so be sure to have fun and embrace your stencils in your vintage, shabby, mixed media, art journaling, industrial or steampunk projects. Our sponsor this month is the very generous Country View Crafts and the random winner will receive a £20 voucher to spend in store.There will also be three pinworthy winners chosen by the Creative Guides who will receive a pinworthy badge for their blog and an invite to be a Guest Designer here at A Vintage Journey for a future challenge. So lets see all the wonderful inspiring projects our Creative Guides have created for this challenge. For my 'Stencil It' project I decided to reacquaint myself with my much neglected art journal and create a journo spread that has both striking imagery and a meaningful message about 'Self Doubt' using several stencils with various mediums- paints, inks,texture paste and gilding wax. 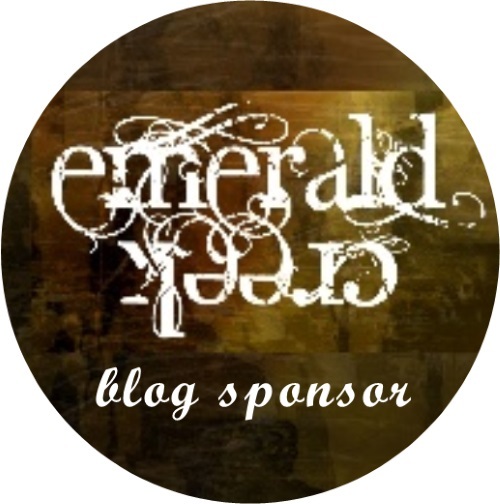 Please feel free to head over to my blog for more details . It's a rare project from me which doesn't include the use of a stencil somewhere, so I loved Amanda's theme. 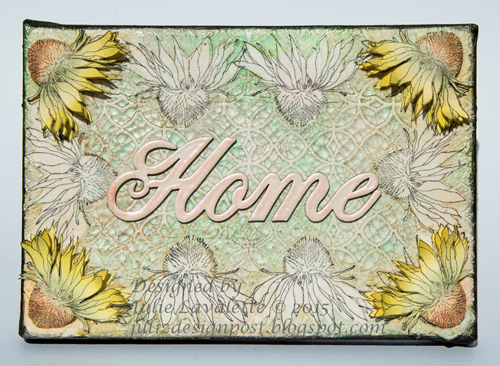 I've been playing with one of the newer Tim Holtz Layering Stencils, some DecoArt crackle paste and my favourite blues and browns to create this tag. Do come over to Words and Pictures if you'd like to see more. A great theme but could I think what to create? - no! Ideas don't seem to be coming too easily at the moment so I decided to get my journal out and just play ...... this is what happened. If you would like to see how I got here please pop over to Addicted to Art. I used multiple stencils (5 in total!) in the making of my mixed media plaque for Amanda's wonderful theme. I coloured through them, embossed with them, stamped through them and used texture paste, inks and paints - I was in stencil heaven! I have a few step by step photos on my blog on how I did it, hope you can stop by to take a look. 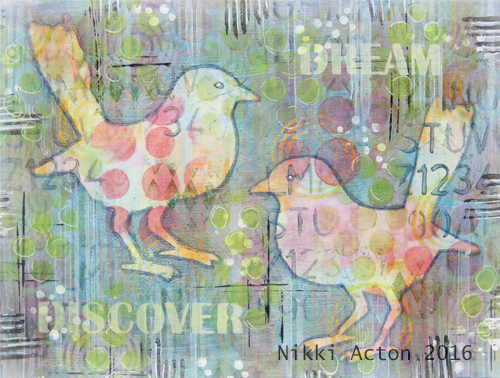 Stencils play a huge part in my creative process so this challenge was perfect for me. I adore adding layers to my designs and Stencils make this process so easy. 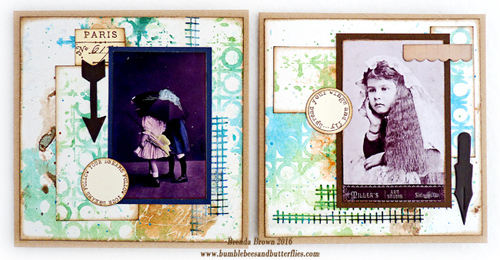 I have step by steps for my silhouette duo over on my BLOG if you would like to stop by. I pulled out several of my Wendy Vecchi stencils, combining them with two of her background stamps and some Idea-ology pieces to create my stencil project. You will find more photos and details on my blog post here. I hope you'll stop by! I had intended using a background made with stencil mono-printing as journal pages but they ended up as two cards. I love the fact that we can creatively start a piece with one idea in mind and end up with something completely different. Click my name above and you will be transported to Bumblebees and Butterflies if you want to see more. I love working with my stencils and decided it would be fun to incorporate them onto a canvas with masking techniques and stamping. 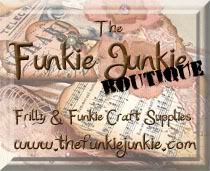 Love for you to stop by my blog Juliz Design Post where I will show you all the ongoing stages . I actually had something of a plan in my head for this canvas, wanting to show how stencils can be used in layers with a variety of textures to create the perfect basis for the addition of a little colour and a scattering of embellishments. Find out how it came together (with a step by step tutorial for that background) on my blog. I think you'll agree our Creative Guides have certainly embraced their stencils and offered a wealth of inspiration . Hope you will be able to join us in our 'Stencil It' challenge. The challenge begins today and runs through to Thursday 1st Sept 2016. 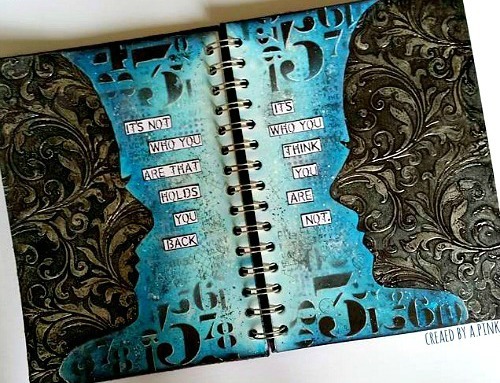 That double journal/notebook page is stunning. I love it. Inspiration overload, I tell ya! This is one fantastic challenge and one amazing array of stencil work. Well done girls! What fantastic projects from everyone - can't wait to see this month's entries! 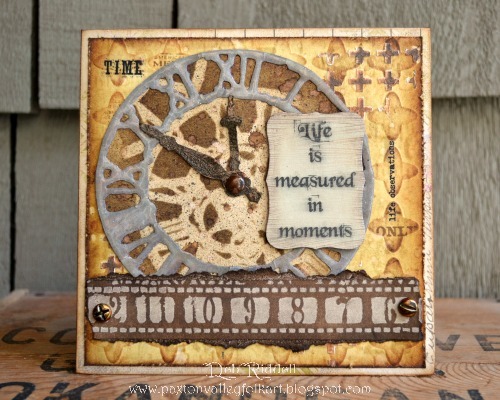 These are fabulous projects, I do love my stencils. Wonderful projects, love stencils, this will be fun for sure! Great challenge theme, Amanda and wonderful projects from the entire group of Creative Guides! What a pile of stencils you all used! Hugs! Beautifully Grungy, Vintagey creations from the DT. An excellent theme too! The projects here are all so beautiful, WOW!! Fabulous creations. HI Roshinis Crafts, The August challenge winners will be announced next Friday so be sure to pop back thento see the Stencil It Challenge winners and Pinworthies post .